文殊 MONJU (Guardian of the Law, Voice of the Law) is one of many meanings. Monju is considered the wisest of the Bodhisattva, and thus acts as the Voice (Expounder) of Buddhist Law. Japanese sculptures of Monju often depict the deity sitting atop a roaring lion or shishi, which symbolizes the voice of Buddhist Law and the power of Buddhism to overcome all obstacles. Shishi are also commonly found guarding the entrance gate to shrines and temples. Monju typically holds the Sutra of Wisdom in the left hand and a sharp sword in the right, which Monju uses to cut through illusion and shed light on the unenlightened mind. In some artwork, Monju carries a lotus flower and sits atop a shishi (mythical lion). Monju’s cult was introduced to Japan by Ennin 圓仁 (794-864 AD; also spelled 円仁), a Japanese monk who visited Wutaishan (a five-terraced mountain in China’s Shanxi Province that today is still a major center of the Monju cult) during his travels to China (838-847 AD). Mañjuśrī is a bodhisattva associated with prajñā (insight) in Mahayana Buddhism. In Tibetan Buddhism, he is also a yidam. His name means “Gentle Glory” in Sanskrit. Mañjuśrī is also known by the fuller name of Mañjuśrīkumārabhūta, literally “Mañjuśrī, Still a Youth” or, less literally, “Prince Mañjuśrī”. A is a door to the insight that all dharmas are unproduced from the very beginning (ādya-anutpannatvād). RA is a door to the insight that all dharmas are without dirt (rajas). PA is a door to the insight that all dharmas have been expounded in the ultimate sense (paramārtha). CA is a door to the insight that the decrease (cyavana) or rebirth of any dharma cannot be apprehended, because all dharmas do not decrease, nor are they reborn. NA is a door to the insight that the names (i.e. nāma) of all dharmas have vanished; the essential nature behind names cannot be gained or lost. Tibetan pronunciation is slightly different and so the Tibetan characters read: oṃ a ra pa tsa na dhīḥ (Tibetan: ༀ་ཨ་ར་པ་ཙ་ན་དྷཱི༔, Wylie: om a ra pa tsa na d+hIH). In Tibetan tradition, this mantra is believed to enhance wisdom and improve one’s skills in debating, memory, writing, and other literary abilities. “Dhīḥ” is the seed syllable of the mantra and is chanted with greater emphasis and also repeated a number of times as a decrescendo. As far as the training goes, it is basically the same as previous years. A lot of Mūtō-dori against knife, sword and rokushakubō. Very often Sōke uses his fingers to “walk” across the hands, which finally captures a finger lock. He makes the attacker to forget he got a weapon in his hand and he just pick it out of the hand of the surprised Uke. Even when it is Taijutsu, the concept of Mūtō-dori is the same principles used. Now it is not many days left until this great seminar weekend in STHLM. This is our last reminder! We have plenty of places left if you haven’t signed up yet. Please sign up on our web site if you want to join us, but please pay the fee when you arrive! We only accept Swedish money, not euro. The cost is 600 SEK for one day, or 1000 SEK for both days, including the extra trainings. Wednesday, Duncan arrives from a successful seminar in Copenhagen, before that he was in Hellsinki. We haven’t planned any training on this evening, I was thinking of taking him out in STHLM city in the evening. If you want to join us, please contact me. Thursday, I have my regular class at 19:30-21:00 in Kaigozan dojo, if Duncan is up for training he will join me and help, if he decides to rest you can train with me if you’re in town early. Sometimes we go to Bishops Arms after training for a few beers, maybe it happens this time to? This will be in our dojo, Albygatan 117 in Sundbyberg. This extra training will be taught by all the Judan that is present including me and Duncan. I don’t know exactly who is coming but I hope all the local ones will come at least? Anyway, we will share the teaching these five hours with a few shorter tea breaks. For a theme this day we said we will do Kihon Happo. It will probably be both basic and advanced, a perfect opportunity to see each instructors take on the basics. 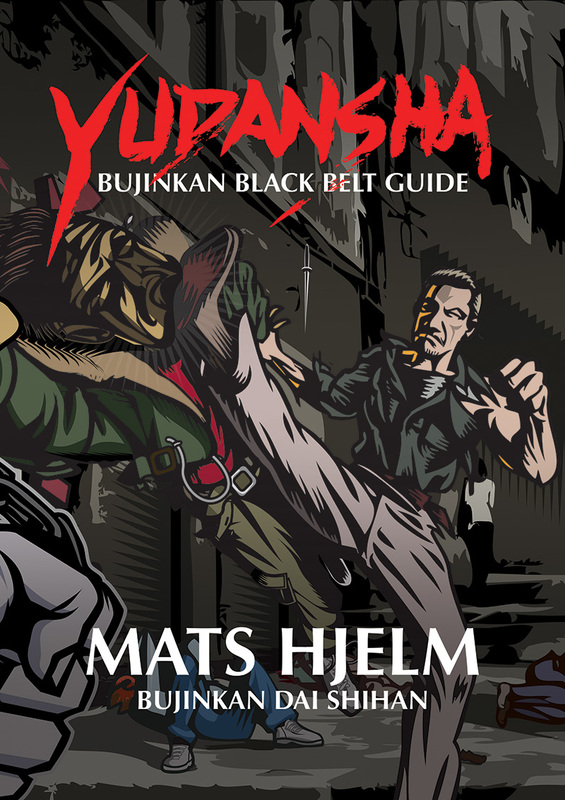 It is free for everyone attending the seminar (and Judan’s), all others have to pay 200 SEK. The seminar is not in our dojo, it is in a Solna Judo dojo about 10 minutes walking distance from our own dojo. The address is Ankdammsgatan 23 in Solna. Note, it is kinda between the houses, you see the sign from the street. We will open up the dojo for registration and warm up around 10:15, the training will start at 11:00 and finish at 18:00. There will be one 60 min lunch break in the middle somewhere. There is not so many restaurants close by, I advice that you bring something with you. I was planning on ordering pizza delivered to the dojo (keep your ears open in the morning). There is a nice Thai restaurant close to the dojo, maybe it is open (keep your ears open saturday morning). We will open up around 10:15, and the training starts at 11:00 and finishes 15:00 same place. Note that we will not have a longer lunch break, only shorter breaks, so bring a sandwich or something to fill up with energy. I plan to take Duncan out for early Dinner before he board the boat to Hellsinki, if you want to join you are welcome. If you come earlier than Saturday morning and want to sleep in the dojo (which is free), then it is in our dojo you can sleep thursday and/or friday night. Saturday night you can sleep in the seminar dojo if you want. If you are coming late thu or fri and can’t make it to the training in time before we finish, please contact me early (I don’t want to wake up and walk 15 minutes in the middle of the night if I’m not prepared). If you are not familiar with the territory, please print out maps or addresses etc. Here is a trailer from the coming Daikomyousai 2009 DVD from Quest, yes that’s me in the picture behind the guy in glasses, and Duncan Stewart as the Uke for Soke. Here is a rough translation of the above. Three day Kobudo seminar held by Masaaki Hatsumi Soke, the successor of the last Ninja, Takamatsu Sensei. People from the whole world attended. Complete recording of all three days. November 30, 2009 Dec 2, Tokyo. This years theme is taijutsu with the feeling of rope, and also a little sword. It is still early to tell how the year will continue, I was there the first two weeks and it will of course change. It is stupid to think you can get the whole thing in just two weeks. As soke so often says, “nothing is decided.” We should go along with what is given by the gods or spirits, not steal techniques or take something that is not given. If you train slowly and correct you should be able to sense what uke is giving you, if you go to fast your ego is directing you and you will not be able to see and use what is given to you. Enlightenment can be found in three places. Under your feet, up in the space (heaven), and written on your eyelids. It is as simple as that. 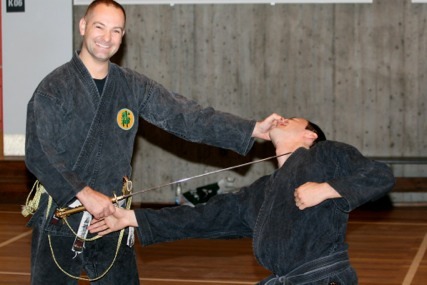 In our case that study Bujinkan it is as simple as Soke says. Go to japan and train with him, and train with those that do to keep yourself on the right path. So simple! To become a master you need three things. Ability (what you are born with), soul (how much you put into the training), and openness (being open enough to take in all that is taught). There is also other words that can explain the kanji in other words, maybe even different. Look them up in a dictionary and read what others already explained on blogs and forums. I wrote this in January already and just discovered it waiting to be posted. Sorry, but better late than never. Today was the first training with soke in honbu dojo. He opened speaking about a new honbu dojo that hopefully can be started on in 3-4 years. The current honbu will stand here for five more years, then the city will build the railway where it stands now. Soke asked us to spread the word that it is ok to send in donations for the new honbu dojo. I would suggest that each dojo-cho will collect money and donate it in the name of respective dojo.